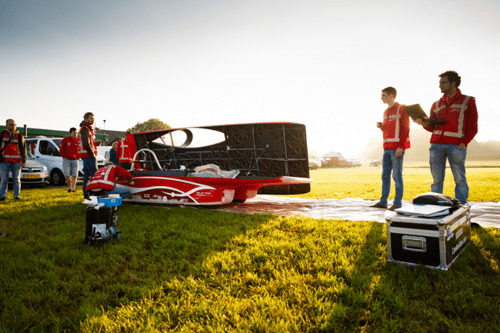 IMS & Solar Team Twente: charging up for the win! Home > News > IMS & Solar Team Twente: charging up for the win! The Solar Team Twente appeared impatiently at the start of the Bridgestone World Solar Challenge in Darwin, Australia, together with 50 other international participants on Sunday 8 October. This is the top race for cars running on solar energy. This year, the Solar Team Twente worked with a number of companies including IMS on the team's seventh car: the ‘Red Shift’. After five exciting days of racing, Solar Team Twente crossed the finish line in Adelaide in 5th place. An outstanding achievement! 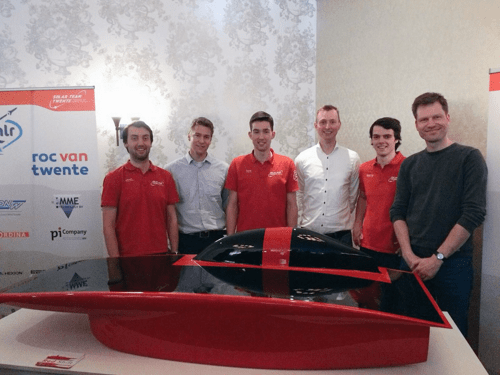 The cooperation between IMS and Solar Team Twente dates back to 2013. We have been involved as a partner in the development (back then) and the production (currently) of the solar car’s steering system. From this year onwards, we have supported the team in producing the new charging configuration. Read this article to find out more about this valuable collaboration, the steering system and the support in the development and successful use of the charging configuration for the car. The team has used the steering system developed with our support for the third consecutive time. The steering system has proven successful in previous competitions, and the team is delighted to continue using it. A special point about this year is that a huge amount has been amended and optimised within the car, but because the steering system is robust and easily utilised, it can be used in every new vehicle. The support of IMS engineers for the steering system this year consisted of the supply of the system and assistance with small changes in the design. The new regulations adopted for the 14th World Solar Challenge mean that this year, the charging configuration of the car has become highly important. The driver must be able to get in and out of the car unassisted by third parties. The panel must use a charging configuration to reach a particular setting. We were asked to support the team in developing a charging configuration. This task covers a number of disciplines within the team and also formed a real challenge for our engineers. We supported the team primarily in the design stage, using the expertise and resources we had in-house. This meant that we came up with several designs and sat down with the team’s engineers every week. The solution, however, was not immediately clear. The programme requirements contained a number of contradictions; something that may have been the best solution for one requirement may have had a negative impact on another requirement. For this reason, the team decided to use lean product development methods and a design concept was created as a follow-up over a few sessions. Our engineers then built a wooden prototype for the team, which they tested personally. It was the team that ultimately constructed and assembled the car. The Solar Team Twente team members also found their collaboration with us extremely valuable: “IMS has provided a lot of assistance during the cooperation; we especially found the weekly meetings very helpful. Our close cooperation allowed us to quickly come up with a design. This was really useful when building the charging configuration”, said Nicole Veldhuis of the Solar Team Twente. The collaboration showed that the teamwork of students and experienced IMS engineers was a good match. The IMS engineers provided advice and support to the team, with plenty of enthusiasm, and remain involved in the creation of the car. On behalf of IMS, we congratulate Solar Team Twente with their 5th place in the World Solar Challenge! 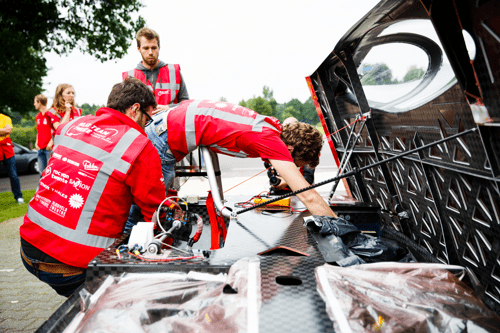 Would you like to find out more about the cooperation with Solar Team Twente or follow them on the road to success?